We’re launching the final Squirky book later this month at the Asian Festival of Children’s Content (more details to come soon) and we’re so glad (yet sentimental) that this series is coming to an end. 1. Quentin (aka Red Commander) meeting Squirky’s Daddy and Mummy back on Earth! 2. A few gorgeous doublespreads illustrated by David (we played around with the layout a little for this last book)! 3. A sneak peek at what Squirky and Emma look like when they are older! 4. Tying up (most of the) loose strings after Book #5! 5. An adoptive parent resource on how to disclose with sensitivity with insights from adoption counsellors. 6. Re-visiting the earlier Squirky books again to see how Squirky has evolved during this awesome space adventure and appreciating the story as a complete tale! We hope you are just as excited about the last book as we are! Categories: Adoption Issues, Squirky Promo | Tags: david liew, kidlit, melanie lee, picturebook, singapore, squirky | Permalink. Hi Clarice, why do you like reading so much? I went to the library and liked the books there. That’s how I became a bookworm. How did you come up with the idea to start a reading club? It all started because one of my classmates forgot to bring a storybook to read for morning silent reading session. I had an extra book and lent it to her. Then I thought, “Why not bring spare books from now onwards to share with more friends?” Some of my classmates also did the same. Everyday, before morning assembly, we share our books with each other. What do your classmates and friends think about your book reading club? They think it’s great. Some tell me to bring more books to share with them everyday. Thank you for sharing Squirky books as part of your book reading club! What do you like about the story so far? For Book 1, I like the humour. At first, I thought Squirky ate too much blueberry jam and turned blue. For Book 2, I like the cool factor, like when Squirky’s “egg” turns into a spaceship. For Book 3, I like the friendship between the Red Commander and Squirky’s birth parents. For Book 4, I like the touching hologram message which Mr and Mrs Quirky recorded for Squirky. If you had to introduce Squirky to your friends who have not read the books, what would you tell them? I will tell them that Squirky is an adventure series which teaches them about love, bravery and kindness. 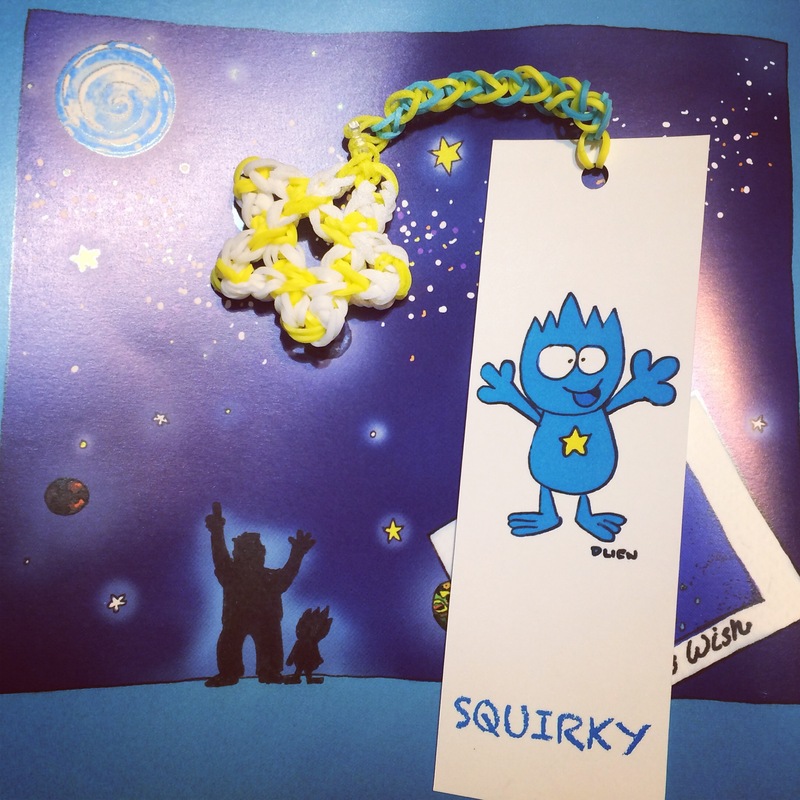 If you could be a character in one of the Squirky books, who would you be and why? I want to be Queen Stella so that I can live in a beautiful grand castle with sparkling stairs. 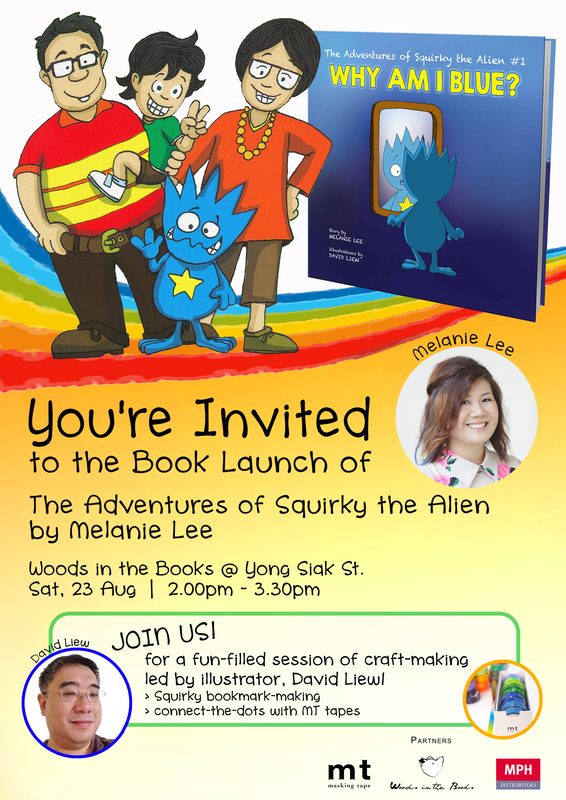 Categories: Squirky Promo | Tags: adventures of squirky, kidlit, melanie, reader, singapore, squirky | Permalink. The other day, C. had a playdate with a couple of friends, and a parent asked if I could do a quick storytelling session with the kids. I didn’t think it was going to be an issue as it was in a nice cosy place with people he was familiar with. However, when the time came, C. proceeded to have a huge meltdown and I had to stop the reading halfway to scoop him up as he writhed around the floor. Like C., I haven’t been that great in sharing him with others. There’s been a fear of not being able to see what’s next, and of being too vulnerable, which is ironic since the story is all about facing such things. I’m working on this. There’s still much to learn. As a start, I’ve been bringing Squirky (stuff toy) along with me whenever I go out, taking pictures of him with people, and getting him out in the open. In the photo above, I brought him to the library and the minute I took him out, these two boys (sitting behind) came up to me to ask who he was. They helped me “art-direct” Squirky for this shot. I hope C. will eventually be comfortable with accompanying me for Squirky storytelling sessions (and he should, because he’s such a drama king). I hope that one day, he’ll realise that this story he sees as his alone is also a story that can belong to many other children. 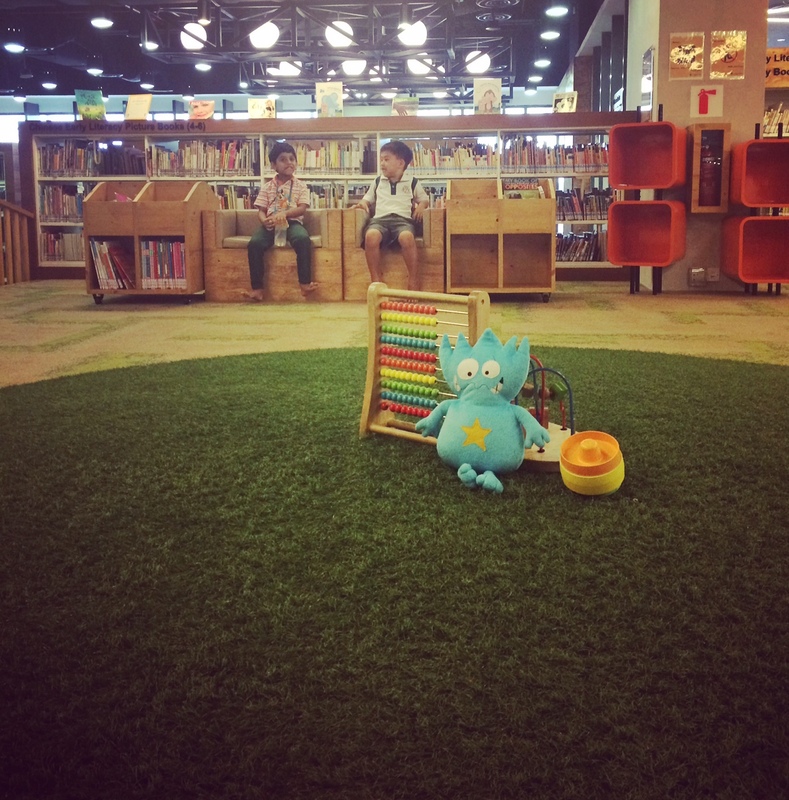 Categories: The Real Squirky | Tags: adoption, kidlit, picturebook, singapore, squirky | Permalink. We’ve been talking to C about adoption these past few months. I’d initially imagined this long, serious sit-down session where we’d tell him the “big” stuff, but given his current attention span, it has been more like “little reveals” along the way. At first, I thought he’d hadn’t even got it, because a few months ago, while reading him Squirky books, I reiterated to him that Squirky was adopted, just like he was adopted. “A doctor? I don’t want to be a doctor. I want to be a fireman,” he said. The next time we brought it up, we talked about how there were many people we knew who were adopted, like Yeye (grandpa), Squirky, Kungfu Panda (who makes him giggle) and Superman (favourite superhero). But it was in reading The Red Thread that made me realise he’s probably getting this much more than we’d ever realised. A king and queen should be full of joy and contentment, but they both feel a strange pain that worsens every day. Then a peddler’s magic spectacles reveal a red thread pulling at each of their hearts. The king and queen know they must follow the thread. To be frank, I didn’t think he’d take well to the book because he typically picks out books on trucks and monsters. I borrowed it because it said “ADOPTION fairytale” and I’ll take whatever adoption literature I can get from the public library. He stayed completely silent the first time I read it. I explained to him that the baby girl was meant to be adopted by the King and Queen and be their daughter. I was pretty stunned how he’d immediately been able to identify himself within that story. And this was confirmed later that night, when he asked if he could wear my hair rubber-band on his wrist “just like the red thread”. He also requested that I buy a ball of red thread to “do craft” based on this book. I had a few issues with the book in terms of representation, especially how “China” is presented as a dirty village where people are dressed in rags. But there’s something about Lin’s storytelling here which kids connect with instantly, as seen by the Amazon reviews. Overall, I’m glad that this book has opened up more opportunities to discuss adoption with C, and hopefully more in his own terms. 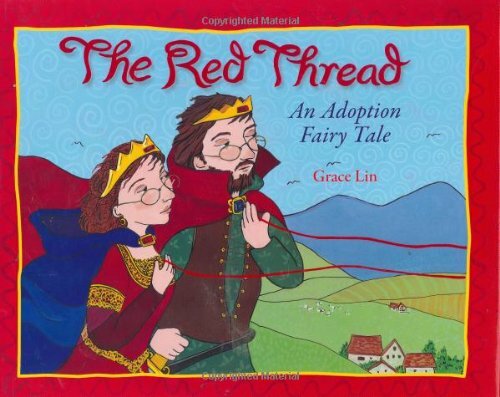 Categories: Adoption Resources, The Real Squirky | Tags: adoption, disclosure, grace lin, squirky, the red thread | Permalink. We’ll be launching The Adventures of Squirky the Alien next Saturday (see above for details) and things have been busy! (And it’s a public event, so feel free to pop by if you’re in this part of the world i.e. Singapore) Am so grateful to Woods in the Books for letting us hold the launch there, MT Masking Tape for sponsoring beautiful washi tapes for the craft activities, MPH Singapore with managing logistics that I’d never quite get around, and friends who have offered help in the running of the event. And of course there’s the illustrator David, who has all these ideas all the time and all I can say is MAN, HELP IS GOOD THANK YOU GOD. 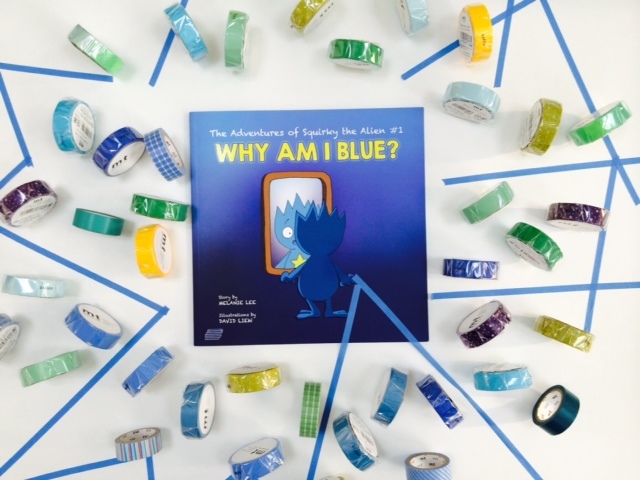 Categories: Squirky Promo | Tags: adoption, book launch, launch, mt masking tape, singapore, squirky, woods in the books | Permalink.